Question: Is curriculum just for schoolteachers and educational experts or does it describe a genuinely biblical process? Answer: It’s the Great Commission! It’s Matthew 28:20! Notice that that’s something more than, “and share with them the plan of salvation,” or “and lead them to a saving knowledge of me.”He says, “Teach them to obey everything I have commanded you.” There’s 28 chapters of everything, friend. And teaching it requires an aggressive, comprehensive, systematic plan. Step 1: Listen sympathetically as a friend shares what they’re experiencing in life. Step 2: Offer a relevant Bible story or Scripture to encourage or even challenge them a little bit. Do you see how this approach ends up being driven by the student’s needs and life and problems? Do you see how that’s not a fulfillment of the Great Commission command to “teach them to obey everything”? Jesus was very responsive to people’s needs. 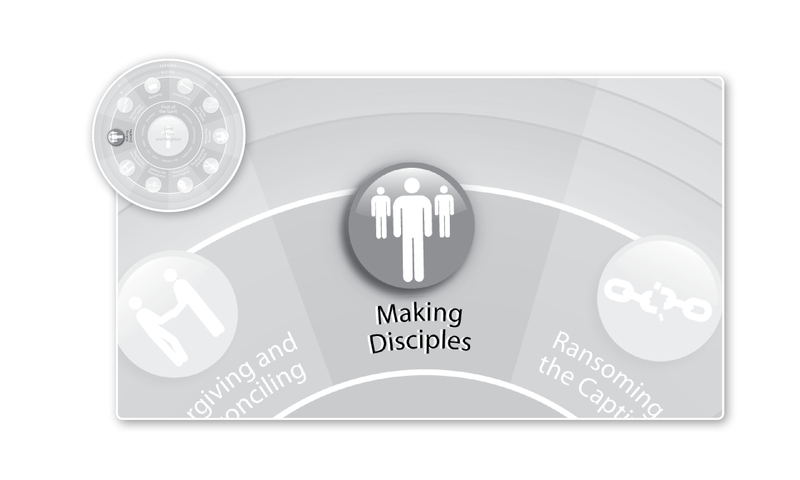 But that’s not what he called discipleship. Discipleship is not the process of meeting people’s needs. It’s the process of learning to obey everything Christ commands. And if you’re a discipler whose discipleship agenda is set by your student, you’re not going to achieve that. Brian Eckhardt, the General Superintendent of the Evangelical Church, says it’s like being a student in medical school. If a student enrolled in medical school, it’s pretty much a given that the curriculum is not going to be set by his interests. This would never happen in a medical school, but it happens all the time in Christian discipleship. The teacher ends up acting as a counselor, and the discipleship relationship ends up being therapy. Therapy is not discipleship. In fact, it’s the opposite. In discipleship the teacher sets the agenda and makes sure to teach everything Christ has commanded. But in the backward process, the student sets the agenda and the teacher becomes a dispenser of advice—like a Pez dispenser only with advice coming out. Like Christ is a Magic 8 Ball. Remember those? Have a problem in life? Shake the Magic 8 ball and see what the answer is. But Christ never permits himself or the things of God to be jumbled around like a Magic 8 Ball. Take, for example, his conversation with the woman he meets at the well in Samaria. In just a few short verses, Jesus crosses social boundaries, reveals himself to be the Messiah, and talks about salvation. But the conversation doesn’t progress like you might think. Jesus takes the Samaritan woman’s question and flips it around her, telling her what she should be asking. “If you knew who it was to whom you were speaking…” he says. “Wrong question,” says Jesus. I set the agenda here. I need to teach you even the right questions to ask, because you will not stumble onto even the right questions based on your own needs and circumstances. Discipleship is not about us answering the questions that interest others about Jesus. It’s not about us doing Scripture therapy to apply the right verse to whatever else those who speak to us. It’s about Jesus the medical professor. He sets the curriculum. We teach it. Others learn it. We all apply it. That’s how we roll. We surrender the agenda of our own needs and concerns in order to prioritize growth to fullness in Christ. And that means disciplining ourselves to sacrifice chatty personal conversations and have redemptive, Christ-centered ones instead. What do you think? Are there other differences between therapy and discipleship? Do the two ever overlap and, if so, where? This entry was posted in Uncategorized and tagged Christianity, Discipleship, Jesus, Making Disciples, Therapy, Whole Life Offering. Bookmark the permalink.